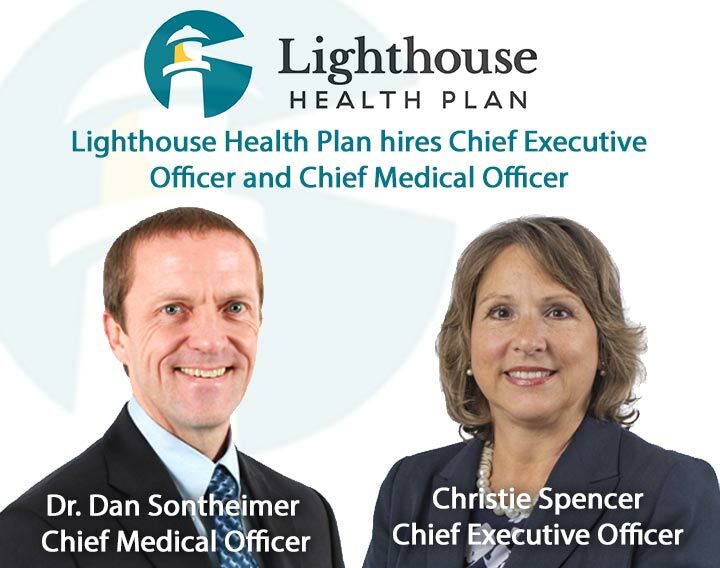 January 18, 2019 –Pensacola, Fl—Lighthouse Health Plan, a new community-based Medicaid health plan created and led by doctors and headquartered in Pensacola, has selected Christie Spencer to serve as its Chief Executive Officer, and Dr. Dan Sontheimer to serve as it’s Chief Medical Officer. In their roles, Spencer and Sontheimer will lead the organization to improve health in the panhandle area through collaboration and engagement of doctors, members, and the community. Spencer has held multiple high-level positions with large national and regional health plans, most recently as the National Medicaid Chief Operations Officer at Evolent Health. She was previously Market President for Evolent Health and Chief Operating Officer for Passport Health Plan, a 300,000+ member Medicaid Managed Care Organization with revenues exceeding $1.5 billion. Spencer earned her bachelor’s degree in business and finance from Oswego University in New York, and earned her Master of Business degree from Loyola College in Baltimore, Maryland. Prior to moving to Pensacola, Sontheimer was the Chief Medical Officer and Vice President at Cox Health. He also served as the President of Baptist Medical Group, and Chief Transformation Officer and Senior Vice President of Baptist Health Care Corporation. He earned his medical degree at the University of Kansas Medical School, and completed his residency in Family Medicine in Spartanburg, S.C. He holds a Master of Business Administration from Regis University in Denver, Colorado. Both look forward to leading the Florida Panhandle’s Medicaid beneficiaries to better health. Lighthouse Health Plan is a local, community-based health plan created and run by doctors. Lighthouse will serve Escambia, Okaloosa, Santa Rosa and Walton counties in Medicaid Region 1 of Florida; and Bay, Calhoun, Franklin, Gadsden, Gulf, Holmes, Jackson, Jefferson, Leon, Liberty, Madison, Taylor, Wakulla, and Washington counties in Medicaid Region 2 as a Provider Sponsored Network (PSN). The PSN plan was created by Florida state legislature in 1997 when the Legislature authorized the Florida Medicaid program to establish a Medicaid PSN demonstration project to capitalize on high-volume Medicaid providers and their ability to manage the medical care of Medicaid beneficiaries they serve. “Provider Service Network” means an entity qualified pursuant to s. 409.912(2) of which a controlling interest is owned by a health care provider, or group of affiliated providers, or a public agency or entity that delivers health services. Health care providers include Florida-licensed health care professionals or licensed health care facilities, federally qualified health care centers, and home health care agencies. Sponsored by Lighthouse Health Plan, LLC and the State of Florida, Agency for Health Care Administration. For more information about Lighthouse Health Plan, please call (844) 243-5176 or visit lighthousehealthplan.com.